The Microchip MGC3130 is the world’s first electrical-field (E-field) based three-dimensional (3D) tracking and gesture controller. The chip is based on Microchip’s patented GestIC® technology and enables user command input with natural hand and finger movements in free-space. 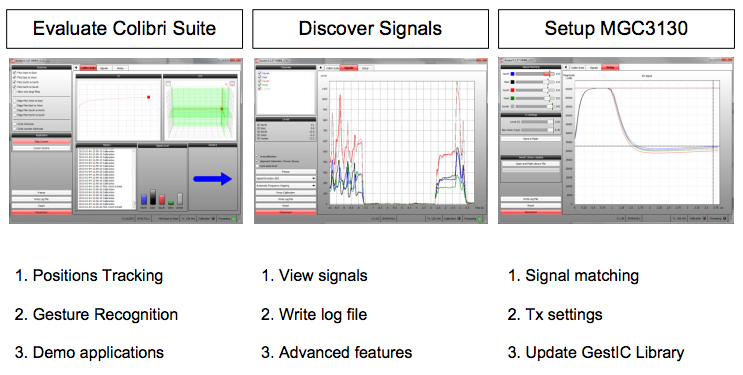 The GestIC® incorporates the Colibri Suite: Digital Signal Processing (DSP) algorithms which enables a wide range of gesture applications shortening development time for developers. Utilizing the principles of electrical near field sensing, the MGC3130 contains all the building blocks to develop robust 3D input sensing systems. Implemented as a low-power mixed-signal configurable controller, it provides a large set of smart functional features with integrated signal driver, a frequency adaptive input path for automatic noise suppression and a digital signal processing unit. Microchip’s on-chip Colibri Suite minimizes processing needs, reduces system power consumption and results in low software development efforts for fast time-to-market success. The MGC3130 is a unique solution that provides gesture information as well as positional data of the human hand in real time and allows realization of a new generation of user interfaces across various industries. Flick gestures - A flick gesture is a unidirectional gesture in a quick flicking motion. Circular gestures - A circular gesture is a round-shaped hand movement. Sensor Touch Gestures - Touch, Tap and Double Tap actions. Microchip’s GestIC® is a 3D sensor technology which utilizes an electric field (E-field) for advanced proximity sensing, allows new user interface applications through detection, tracking and classification of a user’s hand or finger motion in free space. 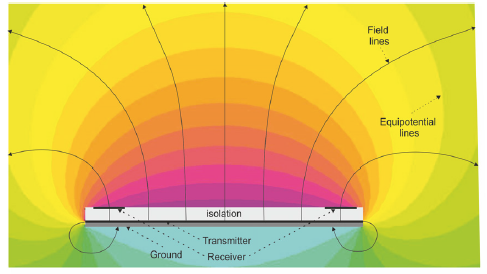 E-fields are generated by electrical charges and propagate three-dimensionally around the surface. sensing conductive objects such as the human body. Microchip’s GestIC® technology uses transmit (Tx) frequencies in the range of 100 kHz which reflects a wavelength of about three kilometers. With electrode geometries of typically less than fourteen by fourteen centimeters, this wavelength is much larger in comparison. 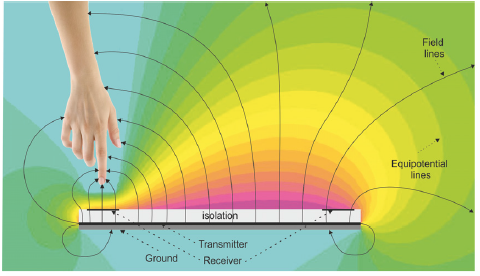 When a person’s hand or finger intrudes the electrical field, the field becomes distorted. The field lines are drawn to the hand due to the conductivity of the human body itself and shunted to ground. The three-dimensional electric field decreases locally. Microchip’s GestIC® technology uses a minimum number of four receiver (Rx) electrodes to detect the E-field variations at different positions to measure the origin of the electric field distortion from the varying signals received. The information is used to calculate the position, track movements and to classify movement patterns (gestures). The illustrations below show both the undistorted idle surface field and the distorted field from an earth-grounded hand in the electric field. The proximity of the hand causes a compression of the equipotential lines and shifts the Rx electrode signal levels to a lower potential which can be measured. The Aurea evaluation software demonstrates Microchip’s GestIC® technology and its features and applications. Aurea provides visualization of MGC3130 generated data and access to GestIC® Library controls and configuration parameters.